The NMCA All-American Nationals decends on "America's Race Track" as the largest street-legal drag racing series descends upon one of the most prestigious drag strips in the worldSummit Motorsports Park in Norwalk, OH. It is bringing 200mph Xtreme Pro Mods along with an assortment of 275 radial classes, Index categories, Big Tire racing for on-track racing and off-track there will be a Car Show and Manufacturer's Midway. Also be part of a special Chevrolet Performance 50th Anniversary COPO Camaro Shootout! 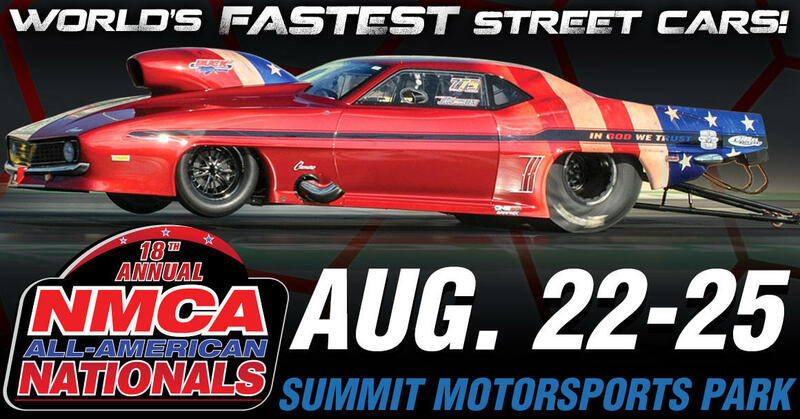 Tighten the blower belts and fill up the nitrous bottles because Championship Street Racing of the NMCA takes over Summit Motorsports Park in Norwalk, Ohio on August 23-26 for a Muscle Car experience you wont soon forget. The All-American Nationals brings in 4,000hp door-slammers of Xtreme Pro Mod as drivers accelerate to 200 mph in less than 4-seconds! DOT-equipped outlaws dash across the world famous drag strip in mind-blowing speeds while some of the best modern and nostalgia Stock Eliminator and Super Stock muscle cars converge on Americas race track. The Chevrolet Performance Challenge Series selected Summit Motorsports Park for its third stop on the four-race circuit, dragging out LS/LT-powered vehicles. Fun, cash and prizes, and a chance for glory headline the Chevrolet Performance Challenge Series. A special feature for the 2019 event is a Chevrolet Performance 50th Anniversary COPO Camaro Shootout that is open to any COPO vehicle from the '60s to today. Keep It LegalTrue Street is the answer to legal street racing and it is open to all domestic cars whose owners want to go fast. A 30-mile cruise, on Saturday August 25th, proves the street capabilities while three consecutive passes on the drag strip establish a 3-run average used to rank the competitors. With 8 winning prizes available, True Street officials rank competitors based on performances and rewards them accordingly. For True Street racers who hang around on Sunday, NMCA gives you a free entry into the bracket race! Have a Late-Model Dodge/Chrysler/Jeep vehicle with a HEMI? Want to race it for FREE? Cruise over to www.NMCAdigital.com/OH for more information on how to enter the Mopar / Dodge HEMI Shootout and enjoy a free weekend of racing your modern muscle car! Do you need a warm up for the US Nationals? Then bring your Cobra Jet to the All-American Nationals to compete in the Ford Performance Cobra Jet Showdown that is open to both modern and vintage Cobra Jets. Win Big, Party Bigthe Aerospace Components Winners Circle caps off a weekend of drag racing by celebrating the class winners and an official Victor trophy awards presentation. Bring a buck for the ice cream and some extra cash for the Power Mall, home of official NMCA merchandise. The on-track action and off-track fun will keep you entertained each day.